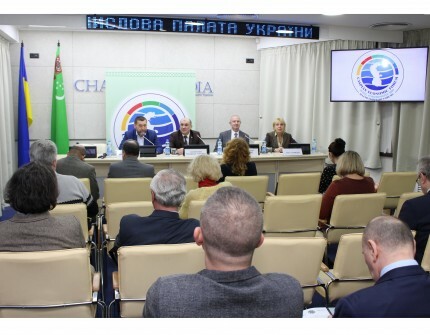 On April 3, 2019, the employees of the Embassy of Turkmenistan, with the support and direct participation of the Ukrainian-Turkmen Business Council at the Ukrainian Chamber of Commerce and Industry, held a presentation on the First Caspian Economic Forum. The presentation was attended by representatives of the Ministry of Foreign Affairs of Ukraine, diplomats of the Embassies of the Caspian states - the Republic of Azerbaijan, the Islamic Republic of Iran, the Republic of Kazakhstan, the Russian Federation, representatives of regional chambers of commerce, research institutes, enterprises and companies of Ukraine, as well as television, numerous local and regional media. The Embassy of Turkmenistan made a presentation of the upcoming First Caspian Economic Forum in Turkmenistan to the participants of the meeting. The participants were acquainted with the concept of the forum, developed in accordance with the Resolution of the President of Turkmenistan Gurbanguly Berdimuhamedov. At the end of the event, informal communication with the participants of the presentation in the format of "question-answer" took place, during which they were actively interested in the opportunity to participate in the forum. In this regard, the Embassy provided all the necessary information about the conditions of participation, and also showed a video about the upcoming First Caspian Economic Forum.